Bonus! Easy 15 Minute Rice Cake Dip Recipe. We pride ourselves on providing solutions for our clients suffering from intestinal issues – which is why we also offer a range of gluten-free and FODMAP recipes on our website. Here’s a delicious lentil & pepper spread that will go great with savoury gluten free products like rice cakes, and is FODMAP-friendly. Place the garlic infused oil, pepper, carrot and herbs into a frying pan. Heat and cook the vegetables for a few minutes to soften them. Add the lentils, miso, vinegar and chopped parsley, and mix well. If you prefer it smoother you can blend. 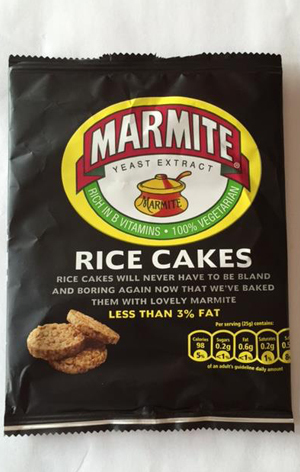 Read more about Marmite‘s products.